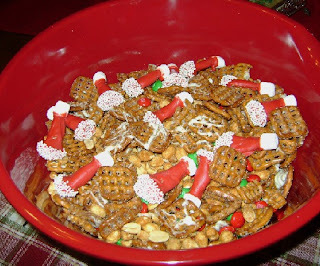 http://pinterest.com/pin/279575089337499109/ added peanuts and red and green M&M's. I also added Bugle santa hats. 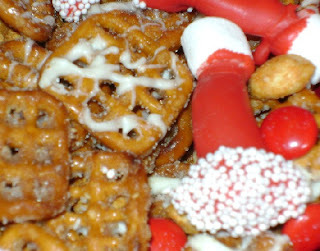 What I did was use Wilton's red chocolate wafers, melt in microwave 30 seconds at a time. First dip all your Bugles in "top" ( pointy part of hat ) first. When this hardened I redipped putting the bottom in the chocolate. Then dip into a small bowl filled with white nonpareil sprinkles. I added marshmallows for Santas white furry pom pom. Dip the marshmallow in a bit of the chocolate to help it stick. Turned out pretty cute! 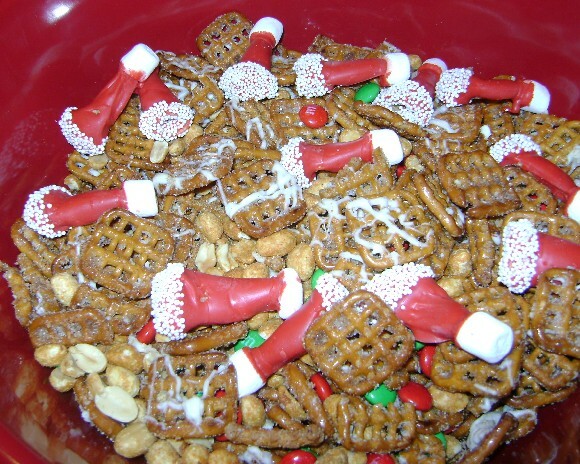 As I was making them they also reminded me of a gnome hat, so if you are ever having a gnome party these would be cute minus the marshmallow.